What happened to the Harkers after the events in Dracula? 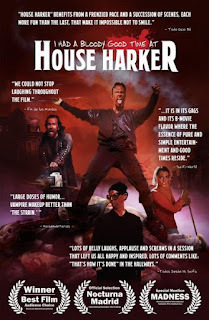 It is a question that has inspired many stories and forms the nub of the lengthily titled I Had a Bloody Good Time at House Harker. Indeed we see a moment from the family’s life in the prologue but the main of the film jumps a few generations down the line. The film is a comedy and has a nicely dark humour and takes a side swipe at Twilight that wasn’t cliched and maintained humour. Plus it has blood… lots and lots of blood. 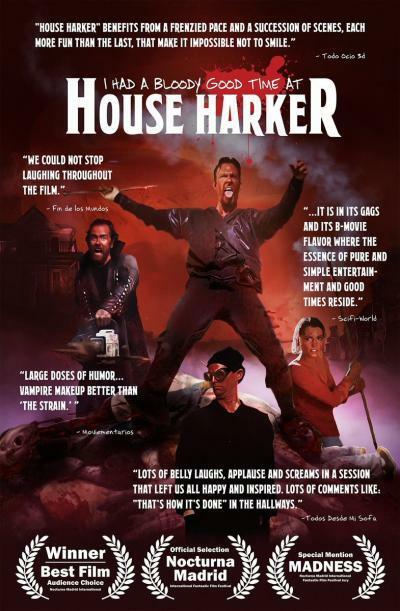 That is the complaint of Ned (Derek Haugen) who is playing the role of the vampire in a staged re-enactment that Gerry Harker (Jacob Givens) is putting on in the Harker house. Gerry is back from Hollywood having starred in Twirl (the Billy Elliott of baton twirling movies… not). The Harker siblings were given a grant to renovate the house and he has blown most of it on the play – which he hopes will make the house a tourist attraction. Also in the play is his neurodivergent brother Charlie (Noel Carroll). However the housing inspector is not impressed – the house is still a death trap and they need to repay the money or renovate the house, fast. Also living at the house is their sister Paige (Whitney Moore), engaged to town sheriff Wayne (Nathan Lorch), she is Ned’s unrequited love. The film does spend a bit of time building these idiosyncratic characters but the crux of the film is a merging of events. Firstly their accidental killing, and posthumous exsanguination, of the Necrophiliac Killer (Peter Story). Following this (and a further death) they ratchet up the play concept to one of “proving” vampires are real. This merges with blood getting on the vampire skull that Quincey kept and sending a psychic call to a vampire (Nate Lane) in Romania, drawing the creature over to claim Dracula’s power. Which is about as much as I want to spoil of the core story. Let us just say that the pretend vampire hunters, along with ex-priest Walter (Arlan Godthaab), have their work cut out. I do need to spoil around the skull, however. The vampire gets it and it levitates, turns to dust and he breathes it in (rather than munching on bone). The film works on a bite and very quickly turn basis. The vampires fear holy symbols, stakes kill and cause them to “pop” – with a small gush of blood, but not entirely liquify. A master vampire can turn to mist during a fight. I mentioned Twilight and there is a book series invented for the film called Succulent by Stacey Mendler (Talya Carroll). She has sparkly vampires in her books, because vampires are beautiful and misunderstood and anyone that says otherwise is being racist. Because of the vampire panic in town she brings her book tour along to set the record straight. This just kind of worked in that meeting/clashing between the monster and the romantic, and the concept maintained amusement levels without falling into the very tired comedy clichés that normally come with shooting the Twilight-fish in the barrel. And these vampires are the monstrous type and the blood flows aplenty, indeed our actors end up drenched in the red stuff. The jokes work well, mostly, though some could have been worked harder (an internet troll (Cody Ward) is cast into the film but so very little is done with him and it seems a bit of a waste, for instance). Bloody, with monstrous vampires and genuinely amusing. What’s not to love. 7.5 out of 10.